Home › Home and Kitchen › Iperfect Kitchen Stainless Steel Lemon And Lime Squeezer - Professional Manua..
Iperfect Kitchen Stainless Steel Lemon And Lime Squeezer - Professional Manua..
EFFORTLESS RESULTS - Easily squeeze every bit of your lemon or lime to the last drop - There's no need to exert much force as it can get every bit of juice out of the fruit with effortless squeeze - Comfortable and simple to use manual press, makes squeezing lemons, limes and oranges effortless! PREMIUM QUALITY - Professional, jumbo size lemon juicer, made from the highest quality 18/10 stainless steel - This tool does not break compared to plastic versions. Nor will it rust, chip or peel. It's built to last indefinitely - Dishwasher Safe! DURABILITY - Made of commercial grade and high quality materials with a polished, mirror finish stainless steel - With its non-stick finish and non-slip long handles for excellent leverage, you never wear out your hands. Suitable for both home cooks and professionals alike! SUPER EASY TO USE - Simply cut fruit in half, and place it cut-side down in the bottom bowl of squeezer, and squeeze the handle. You will be able to squeeze maximum juice out of fruit in a way that you never imagined possible! LIFETIME GUARANTEE - If you have any problems with your Lemon Squeezer for the LIFETIME of the product, simply let us know and we will refund every penny of your purchase, plus ship you another brand new item free of charge! EFFORTLESS RESULTS - Easily squeeze every bit of your lemon or lime to the last drop - There's no need to exert much force as it can get every bit of juice out of the fruit with effortless squeeze - Comfortable and simple to use manual press, makes squeezing lemons, limes and oranges effortless! PREMIUM QUALITY - Professional, jumbo size lemon juicer, made from the highest quality 18/10 stainless steel - This tool does not break compared to plastic versions. Nor will it rust, chip or peel. It's built to last indefinitely - Dishwasher Safe! DURABILITY - Made of commercial grade and high quality materials with a polished, mirror finish stainless steel - With its non-stick finish and non-slip long handles for excellent leverage, you never wear out your hands. Suitable for both home cooks and professionals alike! SUPER EASY TO USE - Simply cut fruit in half, and place it cut-side down in the bottom bowl of squeezer, and squeeze the handle. You will be able to squeeze maximum juice out of fruit in a way that you never imagined possible! 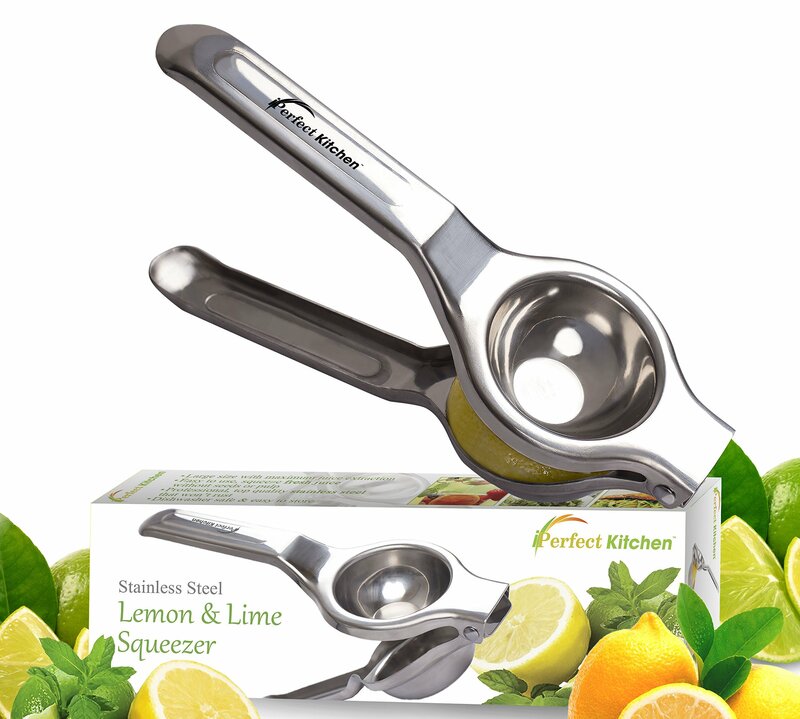 LIFETIME GUARANTEE - If you have any problems with your Lemon Squeezer for the LIFETIME of the product, simply let us know and we will refund every penny of your purchase, plus ship you another brand new item free of charge!